The exhibition will include two clocks with Galet Secret Tourbillon fitted with a double spiral (VIDEO) – individual pieces – which thin dials are made of Meissen porcelain and finished by hand. From now on, on request, customers can have their unique creation of dials of this material tailored to their precise requirements. For 2014 it is expected the arrival of a special collection. 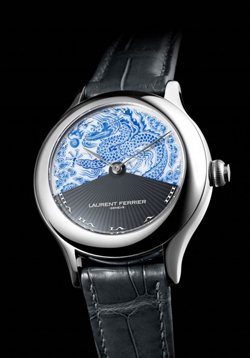 “Through collaboration with Laurent Ferrier we can approach the segment of luxury watches without having to depend on large groups watchmakers. This partnership opens up many new opportunities for our office Meissen Italy, helping to develop its line Meissen Joallerie “said Christian Kurtzke CEO. The clock Laurent Ferrier Secret is equipped with a device that hides the face of the traditional radial to fully display the drawing below.